Change things up with these side-trips from Chiang Mai: Tiger Kingdom (in Mae Rim) and Wat Phra That Doi Suthep (in Doi Suthep). Spend the 4th (Fri) wandering through the wild on a nature and wildlife tour. There's much more to do: delve into the distant past at Wat Chedi Luang Worawihan, look for gifts at Mesimu, soothe aching muscles at some of the top local wellness centers, and tour the pleasant surroundings at Chiang Mai Zoo. To see other places to visit, ratings, reviews, and tourist information, refer to the Chiang Mai trip planner. Mexico City, Mexico to Chiang Mai is an approximately 30-hour flight. The time zone changes from Central Standard Time (CST) to Indochina Time (ICT), which is usually a 13 hour difference. Expect somewhat warmer temperatures when traveling from Mexico City in August; daily highs in Chiang Mai reach 37°C and lows reach 28°C. On the 6th (Sun), wrap the sightseeing up by early afternoon so you can travel to Patong. On the 6th (Sun), take some stellar pictures from Karon View Point. On the next day, don't miss a visit to Bangla Road, then see some colorful creatures with a scuba or snorkeling tour, and then kick back and relax at Patong Beach. To see maps, ratings, where to stay, and tourist information, use the Patong itinerary planner. You can do a combination of flight and taxi from Chiang Mai to Patong in 3 hours. Other options are to take a bus; or drive. In August, daily temperatures in Patong can reach 36°C, while at night they dip to 28°C. Finish your sightseeing early on the 8th (Tue) so you can travel to Bangkok. Bangkok is known for historic sites, shopping, sightseeing, nightlife, and spas. Your plan includes some of its best attractions: explore the historical opulence of The Grand Palace, contemplate in the serene atmosphere at Wat Saket, explore the activities along Chao Phraya River, and shop like a local with Chatuchak Weekend Market. To find traveler tips, ratings, and more tourist information, use the Bangkok custom trip planner. You can do a combination of taxi, flight, and train from Patong to Bangkok in 3.5 hours. Other options are to drive; or take a bus. In August, daily temperatures in Bangkok can reach 39°C, while at night they dip to 30°C. You will have some time to spend on the 12th (Sat) before leaving for Mexico City. 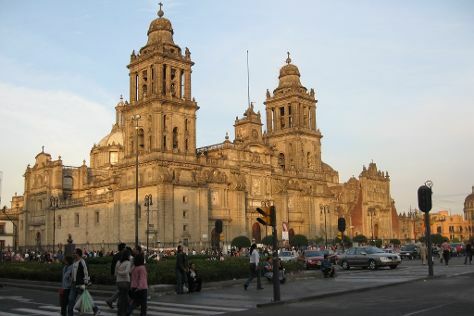 On the 13th (Sun), examine the collection at Frida Kahlo Museum, explore the ancient world of Metropolitan Cathedral (Catedral Metropolitana), then admire the masterpieces at Palacio de Bellas Artes, and finally examine the collection at National Museum of Anthropology (Museo Nacional de Antropologia). Get ready for a full day of sightseeing on the next day: wander the streets of Coyoacan, take in the spiritual surroundings of Basilica de Santa Maria de Guadalupe, then make a trip to Reforma 27, and finally appreciate the extensive heritage of Zocalo. For where to stay, photos, and tourist information, go to the Mexico City itinerary maker. The Route module can help you plan travel from Bangkok to Mexico City. Due to the time zone difference, you'll gain 13 hours traveling from Bangkok to Mexico City. Expect little chillier weather when traveling from Bangkok in August: highs in Mexico City hover around 28°C, while lows dip to 16°C. Cap off your sightseeing on the 14th (Mon) early enough to travel back home.